But Low Carb Diets Eliminate an Entire Food Group! Note: This article is classified as an editorial as it reflects some of my own thoughts on these issues and is also classified as a Science Made Simple article, as it is rooted in the science. By way of references, I have linked to previous articles I have written (that are referenced) or to the original sources, rather than using footnotes and a reference list. One of the common concerns is that a low carbohydrate or ketogenic diet avoids “an entire food group” (i.e. grains) and implies that people will be setting themselves up for decreased nutrient status, or even deficiency if they eat this way, but is that true? Does eliminating this entire food group pose a nutritional risk? That is the subject of this article. I will begin by discussing food groups, however I will make a small but necessary diversion into the evidence used for recent dietary guidelines that recommend a diet low in saturated fat, as there is a link between the two. As will become clear, it is advisable to include grains in a diet that is low in meat and other animal products. With the recent re-design of Canada Food Guide, we’ve seen that food groups are not carved in stone. 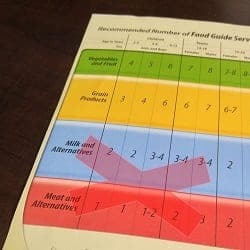 The once-familiar Meat and Alternatives and Milk and Alternatives food groups were completely eliminated in the newest food guide and replaced by the somewhat all-inclusive “Protein” food group. I qualify this by saying ‘somewhat all-inclusive’ because while the illustrated sample plate of the new guide includes approximately equal amounts of animal-based and plant-based proteins, both milk and cheese are not illustrated on the front, although low fat yogurt is. Milk and cheese both figured prominently in the past food guides, as did meat, fish and poultry of all kinds, but now inclusion of cheese and higher fat meats are relegated to the inner pages of the new guide where it is explained how to “limit the amount of foods containing saturated fat” by limiting foods such as “higher fat meat”, “cheeses” and “foods containing lots of cheese” (see this article for details). Of course, milk, cheese and meat can all still be included in the diet, however the new food guide recommends that these be limited due to their high saturated fat content, which is said to be linked to an increased risk of cardiovascular disease. Health Canada writes about how the guidelines were prepared in their report “What are Canada’s Dietary Guidelines?”. They state that they considered the “best available evidence” published between 2006 and 2018 to make their recommendations, but as I will outline below, the 2017 PURE study (Prospective Urban Rural Epidemiology) — which was the largest-ever epidemiological study to date and which recorded dietary intake in 135,000 people in 18 countries over ~ 7.5 years, including high-, medium- and low income nations did not seem to be included. This study found that increased saturated fat intake was NOT associated with increased rates of cardiovascular disease. Health Canada explains in its report that the Guidelines, including Guideline 1 to eat more plant-based food in order to lower the intake of saturated fat was based on “convincing findings” from scientific reports that included extensive systematic reviews of the literature on the relationship between food and health, and that these reports are listed in Table 1 of the report. That is, the new saturated fat guidelines were based on systematic reviews from 2010, 2012, 2013, 2015 as well as the FAO/WHO recommendations from 2010, 2016 and 2017. It appears that the largest-ever epidemiological study (PURE) that was published in 2017 and which found that saturated fat intake was not associated with cardiovascular disease, or increased rates of death was not included or was deemed for some reason to not be “best available evidence”. 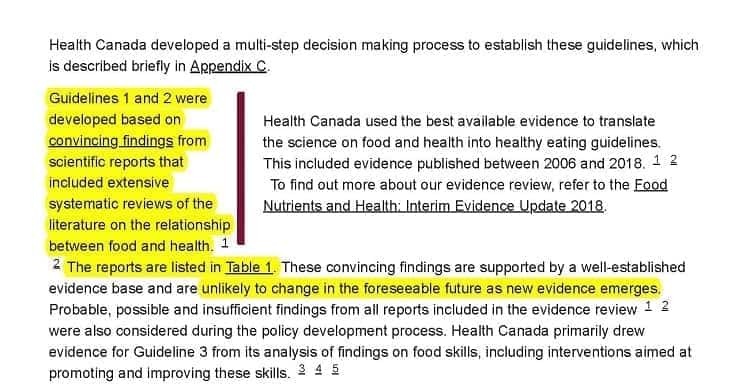 What is puzzling is that a key the 2018 Health Canada report titled Interim Evidence Update lists it as a reference, but doesn’t seem to refer to the study anywhere. More on that in the next article. As pointed out at the end of the previous article, epidemiological studies are the study of diseases in populations. These are helpful for researchers to know which areas warrant clinical trials, because epidemiological studies can’t attribute “cause” of disease or death. When an epidemiological study finds an “association” between two factors such as saturated fat and higher blood lipid levels — this does NOT mean that saturated fat ’causes’ heart disease. It only means that higher saturated fat intake is associated with higher blood lipid values. Other studies associate high blood lipid values such as total LDL cholesterol to cardiovascular disease, but this is only helpful when we know which LDL is raised; the atherosclerotic small, dense sub-fraction or the neutral (or possibly protective) large fluffy sub-fraction. To know whether higher saturated fat intake causes cardiovascular disease events requires clinical trials. There had already been eight meta-analysis and systematic reviews of evidence from randomized control trials (RCT) that had been conducted between 2009-2017 that did not find an association between saturated fat intake and the risk of heart disease that I reviewed in this article — data that was available prior to the redesign of the new food guide. As of this week we also have a new meta-analysis of clinical data from 43 study cohort group studies that was just published on April 6, 2019 which found NO relationship between higher saturated fat intake and higher risk of cardiovascular disease (CVD) events. The recommendations made in the new food guide were based largely on epidemiological evidence and clinical data related to the association between saturated fat and blood lipid levels — sometimes lumping saturated fat and trans fats together. One one would hope that as clinical data from well-designed studies continues to emerge showing no association between saturated fat intake and cardiovascular disease (CVD) — the actual area of concern, that these recommendations will change. If food groups are not carved in stone, dietary recommendations ought not to be either. Is there a valid concern that those eating a low carbohydrate or ketogenic diet who are eliminating a entire food group (i.e. grains) are setting themselves up for decreased nutrient status or deficiency? (2) can those nutrients be found in sufficient quantities in other foods in the diet? If so, then eliminating grains does not predispose people to risk of decreased or deficient nutrient status. Yesterday evening, while writing this post, I stumbled across a recent article title ‘Healthy whole grains’ – really?! that was written by Dr. Zoe Harcombe, a Ph.D. in public health nutrition. 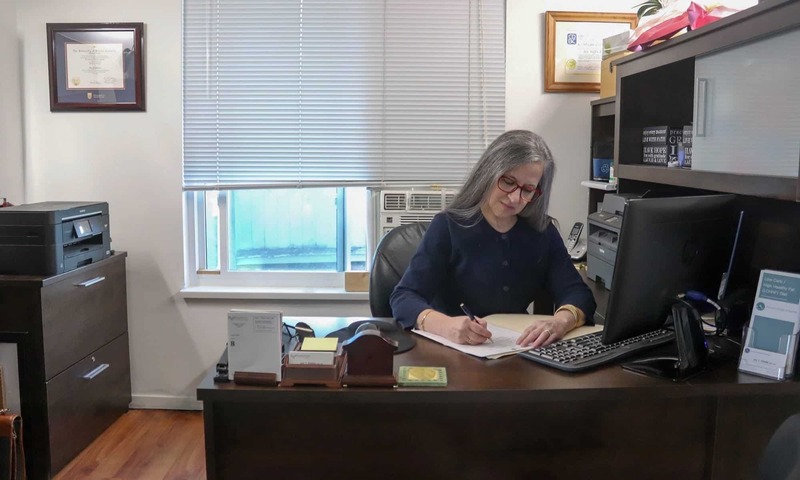 In her article, Dr. Harcombe compiled data from the USDA’s National Nutrient Database for Standard Reference to evaluate the nutrient content in whole grain whole wheat flour, long grain brown rice, whole wheat spaghetti / pasta, oats and whole wheat bread. These foods are representative of what I think most Dietitians would categorize as ‘healthy whole grains’ which are known for being high in B vitamins such as B1 (thiamine), B2 (riboflavin), B3 (niacin) and folate (also called folic acid), as well as minerals such as iron, magnesium and selenium. Dr. Harcombe demonstrated that foods such as chicken liver, sardines, eggs and sunflower seeds are much better sources of the B-vitamins than these “healthy whole grains”. As well, I know from having researched the topic that meat and seafood are excellent sources of the most bioavailable form of iron (heme iron which is superior to the non-heme iron found in grains). As discussed in the previous article, nuts and seeds, dark chocolate and avocados are all rich in magnesium and animal foods such as pork, beef, turkey, chicken, fish, shellfish and eggs are all rich in selenium. Whole grains are also good sources of fiber, but so are the wide range of non-starchy vegetables that are eaten on a well-designed ketogenic diet, as well as the starchy vegetables and berries that are eaten on a well designed low- carbohydrate diet. In fact I wrote an article about this a year and a half ago. In short, there are no nutrients found in grains that are not found in adequate, or even higher quantities in foods eaten as part of a well-designed low carbohydrate or ketogenic diet. As far as I can see, it is only the conviction that there is an established relationship between saturated fat and cardiovascular disease (based on a proxy relationship between saturated fat and blood lipids) and the resulting dietary guidelines based on that relationship that makes the eating of whole grains ‘necessary’. Current dietary guidelines recommend limiting animal foods so eating more plant-based foods and grains containing B-vitamins, iron, magnesium and selenium is necessary. If, however guidelines could change in the future based on emerging evidence (provided that they continue to be validated by future studies), then eating whole grains would be “optional”, since animal-based foods are equal or superior sources of those nutrients. If ‘eating foods with saturated fat causes heart disease’, then limiting them is necessary, and eating whole grains is the next best source of these nutrients. Personality I am not convinced that the evidence is unequivocal and that it is warranted to limit foods rich in saturated fat. At the same time, I am not persuaded that there is evidence that eating lots of saturated fat to the exclusion of other healthy fats is necessary or preferred. Assuming the emerging evidence on the safety of saturated fat continues to hold, I believe including animal foods in the diet precludes the necessity to eat whole grains. For those that choose to follow a vegetarian diet, the inclusion of some whole grains as good sources of B vitamins, iron, magnesium and selenium is advisable. If you would like nutritional support to ensure you are obtaining a wide range of nutrients while following a low carbohydrate diet, I would be glad to help. You can learn more about my services and their costs above under the Services tab or in the Shop. If you have questions, please feel free to send me a note using the Contact Me form above and I will reply as soon as I can.